My nephew is a big fan of Star Wars and wanted me to draw him a picture to hang on his wall. 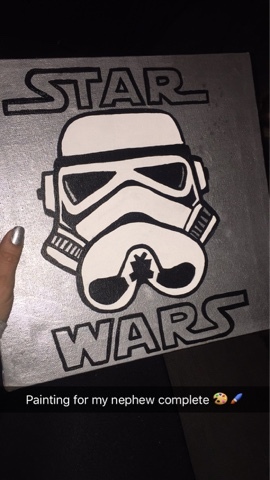 I had an extra canvas laying around and decided to paint one for him instead! This was a quick and easy project and you can choose any image to paint. The first thing I did was spray paint the canvas in a metallic silver to get the shiny background. I then used a pencil to draw the outline of the image. If you are not the best at drawing you can simply print out any image you are choosing to draw and then trace the outline on the canvas. The impression of the pencil will create an outline for you to re-trace in marker or paint. 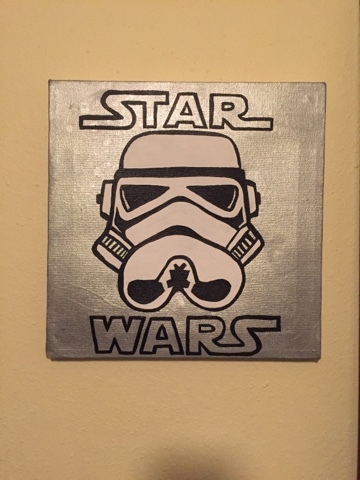 I then used black paint to draw the outline of the storm trooper. Originally I left the metallic silver as the background but then decided to go back and fill it in white. I finished by painting the letters and touching up any areas that needed a second coat. Easy project and a one of a kind to hang on the wall!